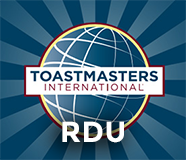 RDU Toastmasters is a club where members get to hone their public speaking and leadership skills. We have a diverse membership and you will learn many different things through attending our meetings. We offer a relaxed, inviting forum to work through your anxieties and become an effective presenter. Come to one, or more of our meetings and see what you think.